I love to support a noble cause and because of this, I would like to give way to a special press release from Yoga For Life. All interested parties can come and join this event and take part in promoting health and awareness on HIV. 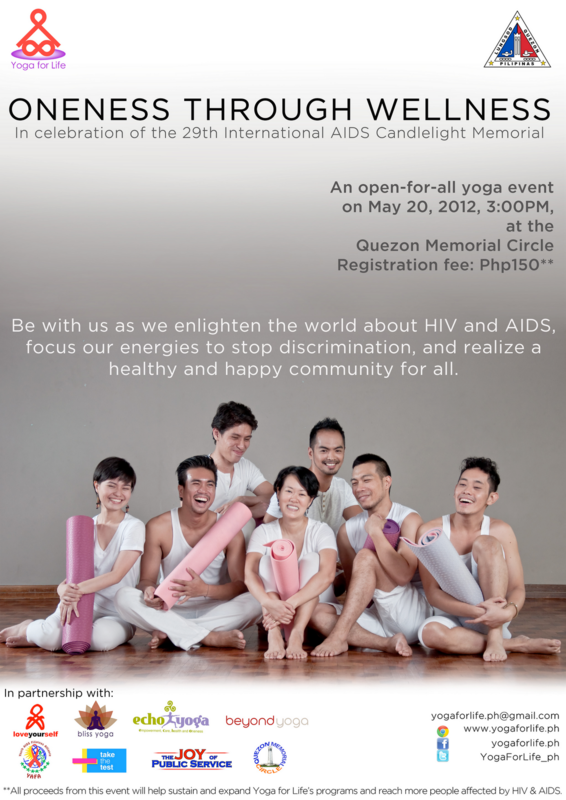 In celebration of the 29th International AIDS Candlelight Memorial, HIV advocacy group Yoga for Life in cooperation with the Local Government of Quezon City, The Love Yourself Project, Take The Test, Youth AIDS Filipinas Alliance, beyond yoga, Bliss Yoga Manila, and ECHO yoga will unite the city in an open for all yoga practice at the Quezon Memorial Circle on May 20, 2012, 4 p.m. during the "Oneness Through Wellness" event. 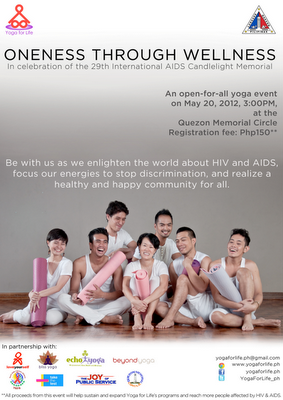 Yoga teachers will guide the public in the mass yoga practice as volunteers educate attendees about HIV and AIDS. The event ultimately aims to promote health and well being among Filipinos, spread awareness about HIV and AIDS, and stop the stigma and discrimination against people living with HIV. Registration starts at 3PM and the event will begin at 4PM sharp.